-Snow was thin but trails were surprisingly flat... rumor has it many farmers planted Soy Bean vs Corn which kept the trails flat. -Headed west on C4... .
Just as a reminder, as president Warner's first official act he developed our new Ride Alert Warning System. So as the riding season begins please watch your email for the latest status, you don't want to be caught off guard when the general Tom Foolery and Shenanigans begin! Nov 2010 - SYR Tailgate. I could not find any reference to blue ice but this is what I found for black ice and white ice.... There might be a quiz! Lake ice occurs primarily in the Northern Hemisphere, where most of the ice is seasonal: it forms in the autumn, thickens during the winter and melts in the spring. Meteorological factors such as air temperature, precipitation, wind speed and radiation balance coupled with physical characteristics of the lakes and ice (lake area, depth, volume and fetch; snow depth; ice thickness, type and albedo) lead to complex interactions and feedbacks that affect the timing of freeze-up and break-up (ice cover duration) each year. Congelation Ice (black ice) forms as water freezes on the bottom of the ice cover and the latent heat of crystallization is conducted upwards through the ice and snow to the atmosphere. Its growth rate is proportional to the rate at which energy is transferred from the bottom surface of the ice layer to the air above. Congelation ice is often referred to as black ice because it has a high optical depth that permits significant light transmission to the underlying water. Snow Ice (white ice) forms when the weight of a snow cover is sufficient to overcome the buoyancy of the ice supporting it, the ice surface becomes submerged and water flows through cracks in the ice and saturates the snow, which then freezes. Snow ice is often referred to as white ice because it contains a large number of densely packed air bubbles and small ice crystals that cause strong light scattering and a high albedo. Weather: still cold…. Minus 18 this morning. Seemed warmer when the sun was out… Got colder at night… No Snow !!! -Back to Clarks for Gas and over to the Hard Times café (I survived Trail 5) for lunch. Bartender Cara laughs as Big John reads yesterdays blog. She enjoyed the Fat Matt comment. -Took trails up to the Glenmore to try to catch the end of the Cuse DePaul game, but they didn’t get the game (Cuse won 59-57). G-Man scolds Falcon for passing on the trail. -Big Moose Lake to Big Moose Rd down to 4th lake. There was a traffic jam on the lake. Crossed the lake and got off by the Red Dog (didn’t stop). -Took FX Matts over to 7th lake house. Not 7th lake boat house. Bartender (Jeff) gets after Falcon “It’s guys like you that make me wish DePaul won”. As we finish our first beer and start to think about leaving, Jeff breaks out chips and salsa…. Stay for second beer. Good Move Jeff. Rich says “I Don’t even know where we are”. Jeff explains black ice. It’s the ice that forms before the snow falls. Johnny said he doesn’t like the old barn. The people are crabby and the urinals smell. Some lady at the bar who liked to listen to our conversations, said the old barn is dark and creepy. It was also commented that they never run the train anymore. Nappi names the house “The walk in cooler”. -Over to Dakers for some snacks (wings and nachos). John paints his electrical cord yellow. -Head to Traven from Dakers. Watch the Kansas / Kansas St game. Drunk Ladies at bar tell him he looks like Tommy Lee Jones. Big-D’s lights didn’t work. Low beam blown and may have some rear lighting issues too. -Tavern to Woods Inn, falcon left on the trail, meets up with them at Woods Inn. Rich and Nappi go home before Woods Inn, Big John goes home after Woods Inn. -Scottie leads falcon, g-man and caddy down to the Red Dog. No one in the parking lot so we head over to Dakers. Place is packed with people from Jersey. Some guy named Pete (from North Jersey) wanted to be our friend. -Left Dakers and went home to eat plates. Weather: cold cold cold…. Minus 8 last night leaving the Tap Room. Minus 20 this morning. 49 degrees in the house… We had to bring the salamander in for auxillary heat. Route: Gas at Big Moose Yammy, down to North Street Snowmobile parts ??? in Old Forge (big-d) needed skags… Trails 1-2, Up to Big Moose Station (Lunch). BMS down trail 10 to 5 to N. Woods. Place was packed with Hockey Players… Went to Dakers. Took Lake to Woods Inn. Boz leaves to go home. Down South Shore to Red Dog. Ran up and down FX Matts (awesome…. sorry you missed it Boz). South Shore up to FX Matts. Falcon & Firth to Dakers, Caddy to bed, Everyone else to Tap Room. Falcon and Firth met up with rest of club at Tap Room. Trail 10 sucked. It was bad Wednesday and still is bad and will continue to be bad until it snows and a grommer comes thru. The 2 trees laying across the trail is a good indication the town of webb has abandoned this trail. Repair Log: Woodys is very happy. 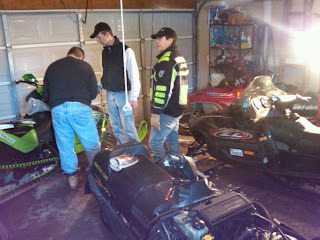 We changed skags on several sleds. Scottie, Caddy, Gman all needed skags…. So did Big D, but we haven’t located a pair yet. Johnny also replaced a belt. Bartenders…. How do you like that? 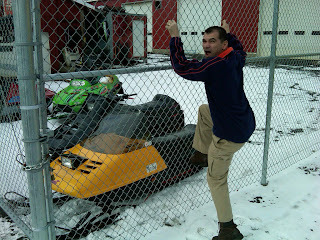 -Matt at Screaming Eagle… Fat Matt. He a big guy that’s for sure… has to turn sideways to get in/out of the bar. Scotty took the ball and ordered pizza and wings at the bar. The site of all that food on the bar got the best of Matt. A lost sausage was sitting on the pizza tray. Matt reaches over, grabs it and pops it in his mouth… How do you like that? -Kelly at the Woods in says the “Killer Bees” are annoying… We all agreed Kelly is looking a little weathered. -Kurt at the Tap Room was sober… This guy is either sober or the drunkest guy in the county. There is no middle ground. Big John asked him if he was an ice fisherman. His idea of ice fishing includes a 12 pack. -Most valuable Member award given to Falcon. -Scotty gives Falcon another remedial lesson on riding the lakes…. From Dakers to Woods Inn… Stay left to Clarks Marina, then cut over to Woods Inn. Going right is a bad idea. -G-Mans sled has a shaved clutch…. It makes easier to change his belt. 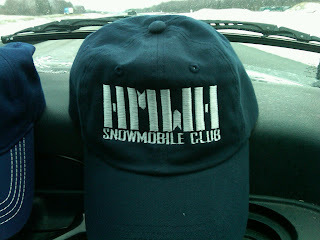 -Hats are helping build the clubs brand equity. Several bartenders and patrons asked about the club. -Do you know the Buffalo Bees…. -Todd took a lot of heat yesterday. Who’s Todd? Ask g-man. Route: 5 to 9 to 1 to cross over down the 17 mile crossing to Trails End (formerly Bucs). Bucs to Timberview. Timberview to Montague. Montague to Pine Tree, Pine Tree to Wayback, Wayback to Tap Room. Tap Room Home. -met a group of couples.... they say to scott, "we don't ride, we plod." -Scott and Rich have a hard time getting up the hill. Question: will they be picked next year? -Scott, the thing I like the best about my new sled: smooth riding suspension, the thing I miss the most about the love seat (old sled) backrest and studs. -Jerry finishes PPT (power point presentation) & talks to boss. Boss says "Its cool you own your own snowmobile... Be Safe." -Left Dakers to have dinner at Glenmore. Trail 10 sucked. Bumpy & hard. -Cluster F on Big Moose Lake. Big D 270 spin, Nappi was lost, Caddy & Nappi thru slush, Scott has to avoid Jerry. ***Denotes first time "virgin" rider..
After a little waffling in the morning, we decided to go for it and take a ride. The sun was out and the snow as heavy. Most trails were fair, some good, some poor, some snirt. All in all a good time was had by all. 54 miles was bad either. Definitely a nice area to ride. I look forward to going back. -Before we made it out of the Fire House fields, the 580 was not behaving. Plugs were changed and ether was sprayed. After a second test drive it was determined the clutch was fried...It would not release. The sled was loaded back on the trailer and big john and Sharon rode tandem. -A quick not here, if you like all your fingers and how they work, do not stick them inside a busted clutch. -Trails were mostly fair with some good and some poor... lots of snirt in the corners. -Took s42B to Skippers Landing. Had a drink and got another card. as we were coming in a couple cops (on sleds) were leaving. the looked (casually) at all the sleds to make sure they were registered. -Rode s42b, to s42 to c4 west into sodus point. on the way we stopped on the trail for a drink. -stopped at Franklin House for dinner. had the place to ourselves... had a couple drinks and some bar food for dinner. -Steger Haus wanted to close, so the men could not get a drink. Tried to stop at Cary Lakefor a beer but the lot was over flowing & no room to park. Access to the back lot was blocked...Headed home. 1) Stop Light not working... Scottie did a little investigation and felt it was the a short in the wiring harness... he was correct. The wire was removed, repaired including soldering the new connections and reinstalled... worked A OK.
2) Battery low... added water to the batter... needs to be charged. 3) Gas gage not working... an inline fuse was missing. Installed a 20 amp fuse (suppose to be 5 amp) and the gage worked fine. 12 pack gone so we called it a night. Launched Cary Lake, Took C4 up to Williamson, groomer just came thru as they were grooming for the Webster Picnic. Crossed 104 and Scottie got hung up on the tracks and bent his skag. We had to break off the first few inches and all was well. Rode the bumps to Rascals in Williamson. Had burgers and beers, watched the Eagles game. The Red Haze is repaired, well almost! 7:10 - Second bolt successfully removed, this one was a little bit tougher to get out but I got it and again the threads in the frame were in tact. 7:11 - Had to turn the heater off it was too hot! 7:21 - Started the Yammy but thought something was wrong way too much smoke, realized the problem was me. I forgot to turn the choke off. 7:22 - Had to open the garage doors, too much smoke! 7:24 - Realized I still had a problem, my speedometer is working intermittently. Must have a loose connection some place. CRAP! 7:25 - Had to halt repairs because of other things I needed to do. Hopefully I can get it figured out maybe tonight! Anyone with electrical knowledge that wants to stop over tonight after 7:15, I will be looking at it. That's it for now! Happy riding and remember a bad day of snowmobiling is better than a good day of work! Unloaded the Scout to run the kids around, found it running on 1 cylinder, again! New coil didn’t last! Had to pull out Phoenix. Buzzed around, tore up grass, driveway, etc. When it melts, I’m in trouble. This led me to thinking…. Scout has run its course. What to do? I can’t sell it as it was a HMWHSC gift. Options? 1. Anyone interested in taking it? 3. Drop it off at salvage on way up and use proceeds for drinks. BTW – Divot, no Divot, Tommy, no Tommy. 10 riders? 2 groups? 1 group? Members returning… I gotta say, this year’s president deserves a round on us for all of the difficult decisions. I didn’t have any of these issues! Hat’s off to you!